Win a My Conservation Baby T-Shirt! Scroll to the bottom of the post for our winners! Want your little one to represent his or her love for the earth in STYLE? 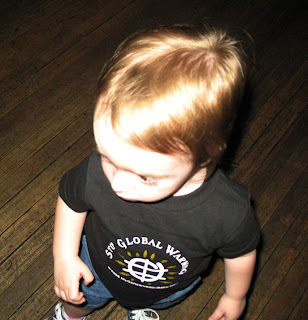 Two lucky winners will win a 2T shirt like Hailey's here, or like the "Protect the Environment" one below. Enter your name and URL or if you don't have a blog or website, enter your email address in this format: http://you@yourdomain.com into the Mr. Linky box below, or send us your name & email to themums@mumsthewurd.com to enter! REMEMBER - if you don't have a blog or website address where we can contact you, you MUST email us or leave your contact info in a comment below Mr. Linky! Thanks! We will draw the names of two lucky winners on Monday, June 18th in the morning!